The bombardment targeted the Yarmouk Basin area, which borders the Israeli-occupied Golan Heights and Jordan, and which is held by the Islamic State-affiliated Khalid Ibn al-Walid Army. President Bashar al-Assad is seeking to recover the entire southwestern corner of Syria in an offensive that got underway last month and has so far recovered swathes of territory from rebels fighting under the Free Syrian Army (FSA) banner. Government helicopters had also dropped barrel bombs on the area - containers filled with explosive material, it said. Assad has so far recovered swathes of Deraa province in the southwest from FSA rebels, many of whom have been forced into surrender agreements mediated by Russian officers. The United States, which once armed the southern FSA rebels, told them at the start of the attack not to expect its intervention. 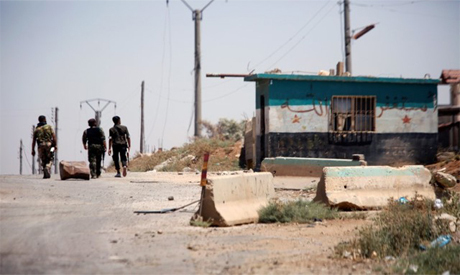 Rebels holed up in a besieged enclave of Deraa city are waiting to hear back from the Russians over demands tabled during a meeting on Tuesday, including safe passage to the rebel-held north for those who wish to leave, rebels said. The Russians told opposition mediators at the meeting they would discuss the proposals with Damascus, an opposition official said in a voice message sent to the Deraa rebels and heard by Reuters. The rebels had asked the Russians to block further ground advances by government forces towards their besieged enclave in Deraa city, which in 2011 was the scene of the first major anti-Assad protests that spiralled into the civil war.